From December 3rd to December 21st, Elmbrook Family Dental will be hosting our 2nd Annual Ronald McDonald House Toy Drive! Stop in during business hours to donate new, unopened toys or gift cards to the children of the Ronald McDonald House. The Ronald McDonald House assists sick and injured children and their families in their time of need. Please help us make this Holiday special for these children by donating new toys purchased within the past 3 months (cannot be opened or gently used) or gift cards for the older children. 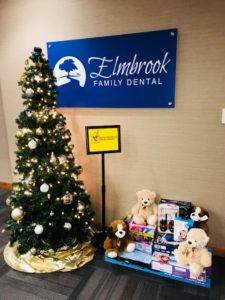 Each toy or gift card donated enters you to win a gift basket from Elmbrook Family Dental valued at over $200! ~Elmbrook Family Dental Partners, S.C.